For other uses of "Hmong", see Hmong (disambiguation). The Hmong people (RPA: Hmoob/Moob, Hmong pronunciation: [m̥ɔ̃ŋ]) are an ethnic group in East and Southeast Asia. They are a sub-group of the Miao people, and live mainly in Southern China, Vietnam and Laos. Some Hmong have emigrated to the United States. 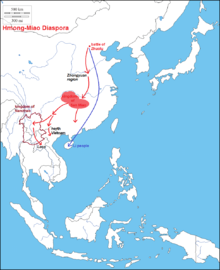 The historical migration of the Hmong. The Hmong (Miao) claim an origin in the Yellow River region of China. According to linguist Martha Ratliff, there is linguistic evidence to suggest that they have occupied some of the same areas of southern China for at least the past 2,000 years. Evidence from mitochondrial DNA in Hmong–Mien–speaking populations supports the southern origins of maternal lineages even further back in time, although it has been shown that Hmong-speaking populations had comparatively more contact with northern East Asians than had the Mien. The ancient town of Zhuolu is considered to be the birthplace of the widely proclaimed legendary Hmong king, Chi You. Today, a statue of Chi You has been erected in the town. The author of the Guoyu, authored in the 4th to 5th century, considered Chi You’s Jui Li tribe to be related to the ancient ancestors of the Hmong, the San-Miao people. In 2011, White Hmong DNA was sampled and found to contain 7.84% D-M15 and 6%N(Tat) DNA. The researchers posited a genetic relationship between Hmong-Mien peoples and Mon-Khmer people groups dating to the Last Glacial Maximum approximately 15-18,000 years ago. A scene depicting the Qing Dynasty's campaign against the Hmong people at Lancaoping in 1795. Conflict between the Hmong of southern China and newly arrived Han settlers increased during the 18th century under repressive economic and cultural reforms imposed by the Qing Dynasty. This led to armed conflict and large-scale migrations well into the late 19th century, the period during which many Hmong people emigrated to Southeast Asia. The migration process had begun as early as the late-17th century, however, before the time of major social unrest, when small groups went in search of better agricultural opportunities. The Hmong people were subjected to abuse and killing by the Qing Dynasty government. Kim Lacy Rogers wrote: "In the eighteenth and nineteenth centuries, while the Hmong lived in south-western China, their Manchu overlords had labeled them 'Miao' ('barbarian' or 'savage') and targeted them for genocide when they defied being humiliated, oppressed, and enslaved." Since 1949, Miao has been an official term for one of the 55 official minority groups recognized by the government of the People's Republic of China. The Miao live mainly in southern China, in the provinces of Guizhou, Hunan, Yunnan, Sichuan, Guangxi, Hainan, Guangdong, and Hubei. According to the 2000 censuses, the number of 'Miao' in China was estimated to be about 9.6 million. 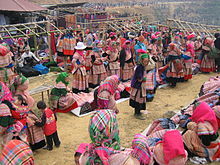 The Miao nationality includes Hmong people as well as other culturally and linguistically related ethnic groups who do not call themselves Hmong. These include the Hmu, Kho (Qho) Xiong, and A Hmao. 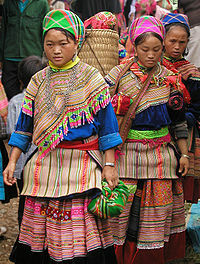 The White Miao (Bai Miao) and Green Miao (Qing Miao) are Hmong groups. A number of Miao lineage clans are also believed to have been founded by Chinese men who had married Miao women. These distinct Chinese-descended clans practice Chinese burial customs instead of Hmong style burials. In Sichuan, they were known as "Chinese Hmong" ("Hmong Sua"). The Hmong were instructed in military tactics by fugitive Chinese rebels. Chinese men who had married into Hmong clans have established several Hmong clans. Chinese "surname groups" are comparable to the Hmong clans which are patrilineal, and practice exogamy. Hmong women married Han Chinese men who pacified the Ah rebels who were fighting against the Ming dynasty, and founded the Wang clan among the Hmong in Gongxian county, of Sichuan's Yibin district. Hmong women who married Chinese men founded a Xem clan in a Hmong village among Northern Thailand's Hmong. Lauj clan in Northern Thailand is another example of a clan created through Han and Hmong intermarriage. A Han Chinese with the family name of Deng found another Hmong clan there as well. Jiangxi Han Chinese have held a claim as the forefathers of the southeast Guizhou Miao. Children were born to the many Miao women who had married Han Chinese soldiers in Taijiang before the second half of the 19th century. The Hmong Tian clan in Sizhou began in the seventh century as a migrant Han Chinese clan. Non-Han women such as the Miao became wives of Han soldiers. These soldiers fought against the Miao rebellions during the Qing and Ming dynasties and at that time Han women were not available. The origin of the Tunbao people can be traced to the Ming dynasty, when the Hongwu Emperor sent 300,000 Han Chinese male soldiers in 1381 to conquer Yunnan and the men married Yao and Miao women. The presence of women presiding over weddings was a feature noted in "Southeast Asian" marriages, such as in 1667 when a Miao woman in Yunnan married a Chinese official. In Yunnan, a Miao chief's daughter married a scholar in the 1600s who wrote that she could read, write, and listen in Chinese and read Chinese classics. The Sichuan Hmong village of Wangwu was visited by Nicholas Tapp who wrote that the "clan ancestral origin legend" of the Wang Hmong clan, had said that there were several intermarriages with Han Chinese and possibly one of these was their ancestor Wang Wu; there were two types of Hmong, "cooked", who sided with Chinese, and "raw", who rebelled against the Chinese. The Chinese were supported by the Wang Hmong clan. A Hmong woman was married by the non-Hmong Wang Wu according to The Story of the Ha Kings in Wangwu village. Hmong people have their own terms for their subcultural divisions. Hmong Der and Hmong Leng are the terms for two of the largest groups in the United States and Southeast Asia. In the Romanized Popular Alphabet, developed in the 1950s in Laos, these terms are written Hmoob Dawb (White Hmong) and Hmoob Leeg (Green Hmong). The final consonants indicate with which of the eight lexical tones the word is pronounced. White Hmong and Leng Hmong speak mutually intelligible dialects of the Hmong language, with some differences in pronunciation and vocabulary. One of the most characteristic differences is the use of the voiceless /m̥/ in White Hmong, indicated by a preceding "H" in Romanized Popular Alphabet. Voiceless nasals are not found in the Leng Hmong dialect. Hmong groups are often named after the dominant colors or patterns of their traditional clothing, style of head-dress, or the provinces from which they come. 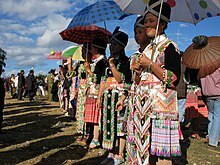 The Hmong groups in Vietnam and Laos, from the 18th century to the present day, are known as Black Hmong (Hmoob Dub), Striped Hmong (Hmoob Txaij), White Hmong (Hmoob Dawb), Leng Hmong (Hmoob Leeg) and Green Hmong (Moob Ntsuab). In other places in Asia, groups are also known as Black Hmong (Hmoob Dub or Hmong Dou), Striped Hmong (Hmoob Txaij or Hmoob Quas Npab), Hmong Shi, Hmong Pe, Hmong Pua, and Hmong Xau, Hmong Xanh (Green Hmong), Hmong Do (Red Hmong), Na Mieo and various other subgroups. These include the Flower Hmong or the Variegated Hmong (Hmong Lenh or Hmong Hoa), so named because of their bright, colorful embroidery work (called pa ndau or paj ntaub, literally "flower cloth"). Usage of the term "Miao" in Chinese documents dates back to the Shi Ji (1st century BC) and the Zhan Guo Ce (late Western Han Dynasty). During this time, it was generally applied to people of the southern regions thought to be descendants of the San Miao kingdom (dated to around the 3rd millennium BC.) The term does not appear again until the Ming dynasty (1368–1644), by which time it had taken on the connotation of "barbarian." Being a variation of Nanman, it was used to refer to one kind of indigenous people in the southern China who had not been assimilated into Han culture. During this time, references to Unfamiliar (生 Sheng) and Familiar (熟 Shu) Miao appear, referring to level of assimilation and political cooperation of the two groups. Not until the Qing dynasty (1644–1911) do more finely grained distinctions appear in writing. Even then, discerning which ethnic groups are included in various classifications can be problematic. This inconsistent usage of "Miao" makes it difficult to say for sure if Hmong and Mong people are always included in these historical writings. Christian Culas and Jean Michaud note: "In all these early accounts, then, until roughly the middle of the 19th century, there is perpetual confusion about the exact identity of the population groups designated by the term Miao. We should, therefore, be cautious with respect to the historical value of any early associations." Linguistic evidence, however, places Hmong and Mong people in the same regions of southern China that they inhabit today for at least the past 2,000 years. By the mid-18th century, classifications become specific enough that it is easier to identify references to Hmong and Mong people. The term 'Miao' is used today by the Chinese government to denote a group of linguistically and culturally related people (including the Hmong, Hmu, Kho Xiong, and A Hmao). The Hmong and Miao of China today believe they are one people with cultural and linguistic affiliations that transcend oceans and national boundaries. The educated elites of the two groups maintain close transnational contacts with one another. A Flower Hmong woman in Vietnam. 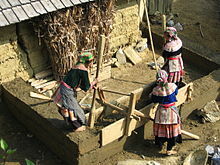 A typical rammed earth house building technique of flower Hmong in Vietnam. In Southeast Asia, Hmong people are referred to by other names, including: Vietnamese: Mèo or H'Mông; Lao: ແມ້ວ (Maew) or ມົ້ງ (Mong); Thai: แม้ว (Maew) or ม้ง (Mong); Burmese: မုံလူမျိုး (mun lu-myo). The xenonym, "Mèo", and variants thereof, are considered highly derogatory by some Hmong people in the USA. The issue came to a head during the passage of California State Assembly Bill (AB) 78, in the 2003–2004 season. [better source needed] Introduced by Doua Vu and Assembly Member Sarah Reyes, District 31 (Fresno), the bill encouraged changes in secondary education curriculum to include information about the Secret War and the role of Hmong people in the war. Furthermore, the bill called for the use of oral histories and first hand accounts from Hmong people who had participated in the war and who were caught up in the aftermath. Originally, the language of the bill mentioned only "Hmong" people, intending to include the entire community. A number of Mong Leng activists, led by Dr. Paoze Thao (Professor of Linguistics and Education at California State University, Monterey Bay), drew attention to the problems associated with omitting "Mong" from the language of the bill. They noted that despite nearly equal numbers of Hmong Der and Mong Leng in the United States, resources are disproportionately directed toward the Hmong Der community. This includes not only scholarly research, but also the translation of materials, potentially including curriculum proposed by the bill. Despite these arguments, "Mong" was not added to the bill. In the version that passed the assembly, "Hmong" was replaced by "Southeast Asians", a more broadly inclusive term. Dr. Paoze Thao and some others feel strongly that "Hmong" can refer to only Hmong Der people and does not include "Mong" Leng people. He feels that the usage of "Hmong" in reference to both groups perpetuates the marginalization of Mong Leng language and culture. Thus, he advocates the usage of both "Hmong" and "Mong" when referring to the entire ethnic group. Other scholars, including anthropologist Dr. Gary Yia Lee (a Hmong Der person), suggest that "Hmong" has been used for the past 30 years to refer to the entire community and that the inclusion of Mong Leng people is understood. [better source needed] Some argue that such distinctions create unnecessary divisions within the global community and will only confuse non-Hmong and Mong people trying to learn more about Hmong and Mong history and culture. As a compromise alternative, multiple iterations of "Hmong" are proposed. A HMong theologian, Rev. Dr. Paul Joseph T. Khamdy Yang has proposed the term “HMong” to encompass both the Hmong and Mong community by capitalizing the H and the M. The ethnologist Jacques Lemoine has also begun to use the term (H)mong when referring to the entirety of the Hmong and Mong community. Some non-Chinese Hmong advocate that the term Hmong be used not only for designating their dialect group, but also for the other Miao groups living in China. They generally claim that the word "Miao" or "Meo" is a derogatory term, with connotations of barbarism, that probably should not be used at all. The term was later adapted by Tai-speaking groups in Southeast Asia where it took on especially insulting associations for Hmong people despite its official status. In modern China, the term "Miao" does not carry these negative associations and people of the various sub-groups that constitute this officially recognized nationality freely identify themselves as Miao or Chinese, typically reserving more specific ethnonyms for intra-ethnic communication. During the struggle for political recognition after 1949, it was actually members of these ethnic minorities who campaigned for identification under the umbrella term "Miao"—taking advantage of its familiarity and associations of historical political oppression. Contemporary transnational interactions between Hmong in the West and Miao groups in China, following the 1975 Hmong diaspora, have led to the development of a global Hmong identity that includes linguistically and culturally related minorities in China that previously had no ethnic affiliation. Scholarly and commercial exchanges, increasingly communicated via the Internet, have also resulted in an exchange of terminology, including Hmu and A Hmao people identifying as Hmong and, to a lesser extent, Hmong people accepting the designation "Miao," within the context of China. Such realignments of identity, while largely the concern of economically elite community leaders, reflect a trend towards the interchangeability of the terms "Hmong" and "Miao." Vietnam, where their presence is attested from the late 18th century onwards and characterized with both assimilation and hostility, is likely to be the first Indochinese country into which the Hmong migrated. During the colonization of 'Tonkin' (north Vietnam) between 1883 and 1954, a number of Hmong decided to join the Vietnamese Nationalists and Communists, while many Christianized Hmong sided with the French. After the Viet Minh victory, numerous pro-French Hmong had to fall back to Laos and South Vietnam. At the 2009 national census, there were 1,068,189 Hmong living in Vietnam, the vast majority of them in the north of the country. The traditional trade in coffin wood with China and the cultivation of the opium poppy – both prohibited only in 1993 in Vietnam – long guaranteed a regular cash income. Today, converting to cash cropping is the main economic activity. As in China and Laos, there is a certain degree of participation of Hmong in the local and regional administration. In the late 1990s, several thousands of Hmong started moving to the Central Highlands and some crossed the border into Cambodia, constituting the first attested presence of Hmong settlers in that country. In 2005, the Hmong in Laos numbered 460,000. Hmong settlement there is nearly as ancient as in Vietnam. After decades of distant relations with the Lao kingdoms, closer relations between the French military and some Hmong on the Xieng Khouang plateau were set up after World War II. There, a particular rivalry between members of the Lo and Ly clans developed into open enmity, also affecting those connected with them by kinship. Clan leaders took opposite sides and as a consequence, several thousand Hmong participated in the fighting against the Pathet Lao Communists, while perhaps as many were enrolled in the People's Liberation Army. As in Vietnam, numerous Hmong in Laos also genuinely tried to avoid getting involved in the conflict in spite of the extremely difficult material conditions under which they lived during wartime. After the 1975 Communist victory, thousands of Hmong from Laos had to seek refuge abroad (see Laos below). Approximately 30 percent of the Hmong left, although the only concrete figure we have is that of 116,000 Hmong from Laos and Vietnam together seeking refuge in Thailand up to 1990. Burma most likely includes a modest number of Hmong (perhaps around 2,500) but no reliable census has been conducted there recently. As result of refugee movements in the wake of the Indochina Wars (1946–1975), in particular, in Laos, the largest Hmong community to settle outside Asia went to the United States where approximately 100,000 individuals had already arrived by 1990. By the same date, 10,000 Hmong had migrated to France, including 1,400 in French Guyana. Canada admitted 900 individuals, while another 360 went to Australia, 260 to China, and 250 to Argentina. Over the following years and until the definitive closure of the last refugee camps in Thailand in 1998, additional numbers of Hmong have left Asia, but the definitive figures are still to be produced. Hmong girl (aged 15) preparing wedding dress, Phố Cáo commune, Hà Giang province, Vietnam. The Hmong population within the United States is centered in the Upper Midwest (Wisconsin, Minnesota) and California. Hmong's in Vietnam today was perceived very varied between different and various political Organization. Due to the Hmong's of Vietnam are a significant small minority, their loyalty toward Vietnamese state was also under question. Nonetheless, most of Hmong's in Vietnam are fiercely loyal to Vietnamese state regardless of Governments, with only those minorities supportive of Hmong resistance in Laos and Cambodia, mostly Christian Hmong's who fell under target and poverty strike by the regime's alienation, since there had been no Hmong armed separatism in the country. The Hmong's in Vietnam also receive cultural and political promotion from the Government alike. This unique feature distanced Vietnamese Hmong's from Laotian Hmong's, whom its Laotian cousins are very hostile and strongly anti-Vietnamese. . While Hmong soldiers were known to assist the North Vietnamese in many situations, Hmong soldiers were also recognized for serving in combat against the NVA and the Pathet Lao, helping block Hanoi's Ho Chi Minh trail inside Laos and rescuing downed American pilots. Though their role was generally kept secret in the early stages of the conflict, they made great sacrifices to help the U.S.
Hmong girls meet possible suitors while playing a ball-throwing game in Laos. ). These events led to the yellow rain controversy when the United States accused the Soviet Union of supplying and using chemical weapons in this conflict. Small groups of Hmong people, many of the second or third generation descendants of former CIA soldiers, remain internally displaced in remote parts of Laos, in fear of government reprisals. Faced with continuing military operations against them by the government and a scarcity of food, some groups have begun coming out of hiding, while others have sought asylum in Thailand and other countries. Hmongs in Laos, in particularly, develop a stronger and deeper anti-Vietnamese sentiment than its Vietnamese Hmong cousins, due to historic persecution caused by the Vietnamese on them. In June 1991, after talks with the UNHCR and the Thai government, Laos agreed to the repatriation of over 60,000 Lao refugees living in Thailand, including tens of thousands of Hmong people. Very few of the Lao refugees, however, were willing to return voluntarily. Pressure to resettle the refugees grew as the Thai government worked to close its remaining refugee camps. While some Hmong people returned to Laos voluntarily, with development assistance from UNHCR, coercive measures and forced repatriation was used to send thousands of Hmong back to the communist regime they had fled. Of those Hmong who did return to Laos, some quickly escaped back to Thailand, describing discrimination and brutal treatment at the hands of Lao authorities. In the 1980s, 1990s and early 2000s, The Center for Public Policy Analysis, a non-governmental public policy research organization, and its Executive Director, Philip Smith, played a key role in raising awareness in the U.S. Congress and policy making circles in Washington, D.C. about the plight of the Hmong and Laotian refugees in Thailand and Laos. The CPPA, backed by a bipartisan coalition of Members of the U.S. Congress as well as human rights organizations, conducted numerous research missions to the Hmong and Laotian refugee camps along the Mekong River in Thailand, as well as the Buddhist temple of Wat Tham Krabok. Amnesty International, the Lao Veterans of America, Inc., the United League for Democracy in Laos, Inc., Lao Human Rights Council, Inc. (led by Dr. Pobzeb Vang Vang Pobzeb, and later Vaughn Vang) and other non-governmental organizations (NGOs) and human rights organizations joined the opposition to forced repatriation. Although some accusations of forced repatriation were denied, thousands of Hmong people refused to return to Laos. In 1996, as the deadline for the closure of Thai refugee camps approached, and under mounting political pressure, the U.S. agreed to resettle Hmong refugees who passed a new screening process. Around 5,000 Hmong people who were not resettled at the time of the camp closures sought asylum at Wat Tham Krabok, a Buddhist monastery in central Thailand where more than 10,000 Hmong refugees were already living. The Thai government attempted to repatriate these refugees, but the Wat Tham Krabok Hmong refused to leave and the Lao government refused to accept them, claiming they were involved in the illegal drug trade and were of non-Lao origin. In 2003, following threats of forcible removal by the Thai government, the U.S., in a significant victory for the Hmong, agreed to accept 15,000 of the refugees. Several thousand Hmong people, fearing forced repatriation to Laos if they were not accepted for resettlement in the U.S., fled the camp to live elsewhere within Thailand where a sizable Hmong population has been present since the 19th century. In 2004 and 2005, thousands of Hmong fled from the jungles of Laos to a temporary refugee camp in the Thai province of Phetchabun. The European Union, UNHCHR, and international groups have since spoken out about the forced repatriation. On 4 June 2007, as part of an investigation labeled "Operation Tarnished Eagle," warrants were issued by U.S. federal courts ordering the arrest of Vang Pao and nine others for plotting to overthrow the government of Laos in violation of the federal Neutrality Acts and for multiple weapons charges. The federal charges allege that members of the group inspected weapons, including AK-47s, smoke grenades, and Stinger missiles, with the intent of purchasing them and smuggling them into Thailand in June 2007 where they were intended to be used by Hmong resistance forces in Laos. The one non-Hmong person of the nine arrested, Harrison Jack, a 1968 West Point graduate and retired Army infantry officer, allegedly attempted to recruit Special Operations veterans to act as mercenaries. In an effort to obtain the weapons, Jack allegedly met unknowingly with undercover U.S. federal agents posing as weapons dealers, which prompted the issuance of the warrants as part of a long-running investigation into the activities of the U.S.-based Hmong leadership and its supporters. On 15 June, the defendants were indicted by a grand jury and a warrant was also issued for the arrest of an 11th man, allegedly involved in the plot. Simultaneous raids of the defendants' homes and work locations, involving over 200 federal, state and local law enforcement officials, were conducted in approximately 15 cities in Central and Southern California in the US. Multiple protest rallies in support of the suspects, designed to raise awareness of the treatment of Hmong peoples in the jungles of Laos, took place in California, Minnesota, Wisconsin, Alaska, and several of Vang Pao's high-level supporters in the U.S. criticized the California court that issued the arrest warrants, arguing that Vang is a historically important American ally and a valued leader of U.S. and foreign-based Hmong. However, calls for then Californian Republican Governor Arnold Schwarzenegger and then President George W. Bush to pardon the defendants were not answered, presumably pending a conclusion of the large and then still-ongoing federal investigation. On 18 September 2009, the US federal government dropped all charges against Vang Pao, announcing in a release that the federal government was permitted to consider "the probable sentence or other consequences if the person is convicted." On 10 January 2011, after Vang Pao's death, the federal government dropped all charges against the remaining defendants saying, "Based on the totality of the circumstances in the case, the government believes, as a discretionary matter, that continued prosecution of defendants is no longer warranted," according to court documents. The Hmong presence in Thailand dates back, according to most authors, to the turn of the 20th century when families migrated from China through Laos and Burma. A relatively small population, they still settled dozens of villages and hamlets throughout the northern provinces. The Hmong were then registered by the state as the Meo hilltribe. Then, more Hmong migrated from Laos to Thailand following the victory of the Pathet Lao in 1975. While some ended up in refugee camps, others settled in mountainous areas among more ancient Hill Tribes. Many Hmong refugees resettled in the United States after the Vietnam War. Beginning in December 1975, the first Hmong refugees arrived in the U.S., mainly from refugee camps in Thailand; however, only 3,466 were granted asylum at that time under the Indochina Migration and Refugee Assistance Act of 1975. In May 1976, another 11,000 were allowed to enter the United States, and by 1978 some 30,000 Hmong people had immigrated. This first wave was made up predominantly of men directly associated with General Vang Pao's secret army. It was not until the passage of the Refugee Act of 1980 that families were able to enter the U.S., becoming the second wave of Hmong immigrants. Hmong families scattered across all 50 states but most found their way to each other, building large communities in California and Minnesota. Today, 260,073 Hmong people reside in the United States the majority of whom live in California (91,224), Minnesota (66,181), and Wisconsin (49,240), an increase from 186,310 in 2000. Of them, 247,595 or 95.2% are Hmong alone, and the remaining 12,478 are mixed Hmong with some other ethnicity or race. The vast majority of part-Hmong are under 10 years old. In terms of cities and towns, the largest Hmong-American community is in St. Paul (29,662), followed by Fresno (24,328), Sacramento (16,676), Milwaukee (10,245), and Minneapolis (7,512). There are smaller Hmong communities scattered across the United States, including those in Michigan (Detroit and Warren); Anchorage, Alaska; Denver, Colorado; Portland, Oregon; Washington; North Carolina (Charlotte, Morganton); South Carolina (Spartanburg); Georgia (Auburn, Duluth, Monroe, Atlanta, and Winder); Florida (Tampa Bay); Wisconsin (Madison, Eau Claire, Appleton, Green Bay, Milwaukee, Oshkosh, La Crosse, Sheboygan, Manitowoc, and Wausau); Aurora, Illinois; Kansas City, Kansas; Tulsa, Oklahoma; Missoula, Montana; Des Moines, Iowa; Springfield, Missouri; Arkansas, and Providence, Rhode Island. Canada's small Hmong population is mostly concentrated within the province of Ontario. Kitchener, Ontario has 515 residents of Hmong descent, and has a Hmong church. There is also a small community of several thousand Hmong who migrated to French Guiana in the late 1970s and early 1980s, that can be mainly found in the Hmong villages of Javouhey (1200 individuals) and Cacao (950 individuals). Some Laos- and Vietnam-based Hmong Animists and Christians, including Protestant and Catholic believers, have been subjected to military attacks, police arrest, imprisonment, extrajudicial killings, and torture on religious grounds. For example, in 2013, a Hmong Christian pastor, Vam Ngaij Vaj (Va Ngai Vang), was beaten to death by police and security forces. In February 2014, in Hanoi, Vietnamese government officials refused to allow medical treatment for a Hmong Christian leader, Duong Van Minh, who was suffering from a serious kidney illness. In 2011, Vietnam People's Army troops were used to crush a peaceful demonstration by Hmong Catholic, Protestant and Evangelical Christian believers who gathered in Dien Bien Province and the Dien Bien Phu area of northwestern Vietnam, according to Philip Smith of the Center for Public Policy Analysis, independent journalists and others. The U.S. Commission on International Religious Freedom has documented official and ongoing religious persecution, religious freedom violations against the Laotian and Hmong people in both Laos and Vietnam by the governments. In April 2011, the Center for Public Policy Analysis also researched and documented cases of Hmong Christians being attacked and summarily executed, including four Lao Hmong Christians. ^ a b Lemoine, Jacques (2005). "What is the actual number of (H)mong in the world?" (PDF). Hmong Studies Journal. 6. ^ Actual number is in dispute, as Hmong people are lumped together with related peoples to form a super-ethnicity - the Miao. Many Hmong find this term offensive. ^ "Hmong people". Encyclopedia Britannica. Retrieved 2017-11-10. ^ "The 2009 Vietnam Population and Housing Census: Completed Results". General Statistics Office of Vietnam: Central Population and Housing Census Steering Committee. June 2010. p. 134. Archived from the original on 18 October 2013. Retrieved 26 November 2013. ^ "American FactFinder". Factfinder2.census.gov. Retrieved 2012-06-07. ^ "ABS Census – ethnicity". Retrieved 2012-06-07. ^ "Hmong's new lives in Caribbean". 2004-03-10. Retrieved 2014-03-11. ^ Canada. "Census Profile, 2016 Census". ^ Bomar, Julie. "Hmong History and Culture." Kinship networks among Hmong-American refugees. New York: LFB Scholarly Pub., 2004. 33-39. Print. ^ Ratliff, Martha. "Vocabulary of Environment and Subsistence in Proto-language," p. 160. ^ Bo Wen, et al. "Genetic Structure of Hmong–Mien Speaking Populations in East Asia as Revealed by mtDNA Lineages." Molecular Biology and Evolution 2005 22(3):725–734. ^ De la Cadena, Marisol. Starn, Orin. Wenner-Gren Foundation for Anthropological Research. (2007). Indigenous experience today. Berg Publishers, 2007. ISBN 978-1-84520-519-5. pg 239. ^ "國語•楚語下". Retrieved 23 April 2018. ^ Cai, Xiaoyun; Qin, Zhendong; Wen, Bo; Xu, Shuhua; Wang, Yi; Lu, Yan; Wei, Lanhai; Wang, Chuanchao; Li, Shilin; Huang, Xingqiu; Jin, Li; Li, Hui; Consortium, the Genographic (31 August 2011). "Human Migration through Bottlenecks from Southeast Asia into East Asia during Last Glacial Maximum Revealed by Y Chromosomes". PLOS ONE. 6 (8): e24282. doi:10.1371/journal.pone.0024282. PMC 3164178. PMID 21904623 – via PLoS Journals. ^ Culas and Michaud, 68–74. ^ Rogers, 2004 p. 225. ^ Stephan Feuchtwang (2004). Making Place: State Projects, Globalisation and Local Responses in China. Psychology Press. pp. 141–. ISBN 978-1-84472-010-1. ^ Nicholas Tapp (2001). The Hmong of China: Context, Agency, and the Imaginary. BRILL. pp. 204–. ISBN 0-391-04187-8. ^ Tao Tao Liu; David Faure (1 March 1996). Unity and Diversity: Local Cultures and Identities in China. Hong Kong University Press. pp. 88–. ISBN 978-962-209-402-4. ^ Nicholas Tapp (2010). The Impossibility of Self: An Essay on the Hmong Diaspora. LIT Verlag Münster. pp. 100–. ISBN 978-3-643-10258-4. ^ Narendra Singh Bisht; T. S. Bankoti (1 March 2004). Encyclopaedia of the South East Asian Ethnography. Global Vision Publishing House. pp. 243–. ISBN 978-81-87746-96-6. ^ David Levinson (1993). Encyclopedia of world cultures. G.K. Hall. p. 93. ISBN 978-0-8168-8840-5. ^ Timothy J. O'Leary (1991). Encyclopedia of world cultures: North America. Hall. p. 93. ISBN 978-0-8168-8840-5. ^ Melvin Ember; Carol R. Ember (1999). Cultures of the world: selections from the ten-volume encyclopedia of world cultures. Macmillan Library Reference. p. 252. ^ Tao Tao Liu; David Faure (1 March 1996). Unity and Diversity: Local Cultures and Identities in China. Hong Kong University Press. pp. 86–. ISBN 978-962-209-402-4. ^ Tao Tao Liu; David Faure (1996). Unity and Diversity: Local Cultures and Identities in China. Hong Kong University Press. pp. 86–. ISBN 978-962-209-402-4. ^ Nicholas Tapp (1989). Sovereignty and Rebellion: The White Hmong of Northern Thailand. Oxford University Press. p. 169. ISBN 978-0-19-588912-3. ^ Asian Folklore Studies. Nanzan University Institute of Anthropology. 2002. p. 93. ^ Mark Bender (10 March 2006). Butterfly Mother: Miao (Hmong) Creation Epics from Guizhou, China. Hackett Publishing. pp. xvii–. ISBN 1-60384-335-3. ^ Mark Elvin (1 October 2008). The Retreat of the Elephants: An Environmental History of China. Yale University Press. pp. 216–. ISBN 978-0-300-13353-0. ^ Spreading the Dao, Managing Mastership, and Performing Salvation: The Life and Alchemical Teachings of Chen Zhixu. ProQuest. 2008. pp. 70–. ISBN 978-0-549-44283-7. ^ Louisa Schein (2000). Minority Rules: The Miao and the Feminine in China's Cultural Politics. Duke University Press. pp. 61–. ISBN 0-8223-2444-X. ^ Susan Brownell; Jeffrey N. Wasserstrom (1 January 2002). Chinese Femininities, Chinese Masculinities: A Reader. University of California Press. pp. 392–. ISBN 978-0-520-21103-2. ^ Brackette Williams (2 December 2013). Women Out of Place: The Gender of Agency and the Race of Nationality. Routledge. pp. 98–. ISBN 978-1-135-23476-8. ^ James Stuart Olson (1 January 1998). An Ethnohistorical Dictionary of China. Greenwood Publishing Group. pp. 340–. ISBN 978-0-313-28853-1. ^ "Tunbao people spring preformance [sic]". English--People's Daily Online. 27 February 2005. ^ Barbara Watson Andaya (2006). The Flaming Womb: Repositioning Women in Early Modern Southeast Asia. University of Hawaii Press. pp. 205–. ISBN 978-0-8248-2955-1. ^ Barbara Watson Andaya (2006). The Flaming Womb: Repositioning Women in Early Modern Southeast Asia. University of Hawaii Press. pp. 20–. ISBN 978-0-8248-2955-1. ^ Nicholas Tapp (2001). The Hmong of China: Context, Angency, and the Imaginary. BRILL. pp. 333–. ISBN 0-391-04187-8. ^ Nicholas Tapp (2001). The Hmong of China: Context, Angency, and the Imaginary. BRILL. pp. 327–. ISBN 0-391-04187-8. ^ Tapp, Nicholas. "Cultural Accommodations in Southwest China: the "Han Miao" and Problems in the Ethnography of the Hmong/Mong." Asian Folklore Studies, Vol. 61, 2002: 78. ^ a b Tapp, Nicholas. "Cultural Accommodations in Southwest China: the "Han Miao" and Problems in the Ethnography of the Hmong." Asian Folklore Studies, Vol. 61, 2002: 78. ^ "Flower Hmong: Preserving Traditional Culture in Vietnam". Ten Thousand Villages. 2010. Retrieved 21 January 2011. ^ Diamond, Norma "Defining the Miao: Ming, Qing, and Contemporary Views" in Cultural Encounters on China's Ethnic Frontiers, ed. Stevan Harrell. Univ. of Washington Press, Seattle, 1995 (99–101). ^ Culas, Christian and Jean Michaud. "A Contribution to the Study of Hmong (Miao)." In: Hmong/Miao in Asia. Ed. Nicholas Tapp, et al. Chiang Mai: Silkworm Books, 2004: 64. ^ Ratliff, Martha. "Vocabulary of environment and subsistence in the Hmong–Mien Proto-Language." in Hmong/Miao in Asia. p: 160. ^ For example: Dao Yang, Hmong At the Turning Point (Minneapolis: WorldBridge Associates, Ltd., 1993), footnote 1, p. xvi. ^ Graham, David Crockett (1954). Songs and Stories of the Ch'uan Miao. Smithsonian Miscellaneous Collections. 123,1. Washington, D.C.: Smithsonian Institution. ^ Lee, Mai Na (1998). "The Thousand-Year Myth: Construction and Characterization of Hmong". Hmong Studies Journal. 2 (2). Archived from the original on 26 May 2005. Retrieved 10 September 2008. ^ Romney, Lee. "Bill spurs bitter debate over Hmong identity[dead link]." L.A. Times, 24 May 2003. ^ Lee, Gary and Nicholas Tapp. "Current Hmong Issues: 12-point Statement". ^ Duffy, John, Roger Harmon, Donald A. Ranard, Bo Thao, and Kou Yang. "People Archived 2012-09-16 at the Wayback Machine". In The Hmong: An Introduction to their history and culture. The Center for Applied Linguistics, Culture Profile No. 18 (June 2004): 3. ^ Tapp. Nicholas. "Cultural Accommodations in Southwest China: the "Han Miao" and Problems in the Ethnography of the Hmong." Asian Folklore Studies, Vol. 61, 2002: 97. ^ Cheung Siu-Woo "Miao Identity in Western Guizhou: Indigenism and the politics of appropriation in the southwest china during the republican period" in Hmong or Miao in Asia. 237–240. ^ Schien, Louisa. "Hmong/Miao Transnationality: Identity Beyond Culture." in Hmong or Miao in Asia. 274–5. ^ Lee, Gary Y. Dreaming Across the Oceans: Globalization and Cultural Reinvention in the Hmong Diaspora. Hmong Studies Journal, 7:1–33. ^ Culas and Michaud, 2004, in Tapp, Michaud, Culas and Lee, Hmong/Miao in Asia. SIlkworm. ^ Bonnin, Christine 2011, Markets in the Mountains: Exploring Geographies of Market Exchange, Trade Practices and Trader Livelihoods in Upland Northern Vietnam. PhD dissertation, McGill University. ^ Michaud, J. et al. 2016 The Historical Dictionary of the Peoples of the Southeast Asian Massif. Rowman & Littlefield, pp.177-180. ^ Tapp, Nicholas, 1989 Sovereignty and Rebellion. Oxford. ^ Cooper, Robert G. 1984 Resource scarcity and the Hmong response. Singapore University Press, Singapore. ^ Culas and Michaud 2004. ^ Lemoine. "What is the number of the (H)mong in the world." ^ Warner, Roger, Shooting at the Moon, (1996), pp366. ^ Hmong National Development, Inc. ""The State of the Hmong American Community 2013"" (PDF). Archived from the original (PDF) on 2 October 2013. Retrieved 7 July 2016. ). Mother of Writing: The Origin and Development of a Hmong Messianic Script. University of Chicago Press, March 23, 1990. 10. Retrieved from Google Books on March 23, 2012. ISBN 0-226-76286-6, ISBN 978-0-226-76286-9. ^ Not to be confused with the Thai royal title Chao Fa. ^ Jonathan Tucker (Spring 2001). "The Yellow Rain Controversy: Lessons for Arms Control Compliance" (PDF). The Nonproliferation Review. ^ Kinchen, David (2006-11-17). "438 former "Cob Fab" removed by helicopter after they came out of hiding". Hmong Today. Archived from the original on 2007-02-22. Retrieved 2007-03-22. ^ "Laos agrees to voluntary repatriation of refugees in Thailand," U.P.I., June 5, 1991. ^ "Lao Refugees Return Home Under European Union Repatriation Program," Associated Press Worldstream, 22 11, 1994. Karen J, "HOUSE PANEL HEARS CONCERNS ABOUT HMONG," States News Service, April 26, 1994. ^ Hamilton-Merritt, Jane. Tragic Mountains. p. xix–xxi. ^ STEVE GUNDERSON, "STATE DEPARTMENT OUTLINES RESETTLEMENT GUIDELINES FOR HMONG REFUGEES," Congressional Press Releases, May 18, 1996. ^ "Laos refuses to take back Thai-based Hmong refugees," Deutsche Presse-Agentur, August 20, 1998. ^ "Hmong refugees pleading to stay". BBC News. July 28, 2005. Retrieved May 4, 2010. ^ "Charges dropped against 12 Hmong men accused in plot to overthrow Laotian government". Los Angeles Times. January 10, 2011. Retrieved 2011-01-15. ^ Baird, Ian G. (2013). The monks and the Hmong: The special relationship between the Chao Fa and the Tham Krabok Buddhist Temple in Saraburi Province, Thailand. In Vladimir Tikhonov and Torkel Brekke (eds. ), Violent Buddhism – Buddhism and Militarism in Asia in the Twentieth Century. London: Routledge. pp. 120–151. ^ "Census Bureau Homepage". Census.gov. 2012-05-25. Retrieved 2012-06-08. ^ "Rhode Island's Hmong-Lao community to mark 40 years of resettlement". The Providence Journal. 8 May 2016. Retrieved 19 September 2017. ^ Canada, Government of Canada, Statistics. "2011 National Household Survey Profile - Census subdivision". ^ "Info about the Hmong in French Guyana - KaYing Yang, Hmong Cultural Center, 1994". Web.archive.org. 2007-09-01. Archived from the original on 2007-09-01. Retrieved 2012-06-08. ^ "About Questia - Questia, Your Online Research Library". www.questia.com. ^ Saturday; April 2011, 16; Analysis, 3:55 pm Press Release: Center for Public Policy. "Laos, Vietnam Troops Execute 4 Hmong Christians - Scoop News". www.scoop.co.nz. ^ Correspondent, Our Vietnam (28 March 2013). "Hmong Christian Leader in Vietnam Beaten to Death in Police Custody, Sources Say". Morningstar News. ^ "Hanoi Hospitals Refuse Treatment to Ailing Hmong Christian Leader". Radio Free Asia. ^ "Agence France Press (AFP), (6 May 2011)"Vietnam troops 'use force' at rare Hmong protest"". ^ "Agence France Press (AFP), (15 April 2011) "Laos, Vietnam troops kill four Hmong Christians: NGO"". Fadiman, Anne (1997). The Spirit Catches You and You Fall Down: A Hmong Child, Her American Doctors, and the Collision of Two Cultures. Farrar, Straus and Giroux. ISBN 0-374-26781-2. [TYPN 1992] The section on nomenclature draws heavily on Thai-Yunnan Project Newsletter, Number 17, June 1992, Department of Anthropology, Australian National University. Material from that newsletter may be freely reproduced with due acknowledgment. W.R. Geddes. Migrants of the Mountains: The Cultural Ecology of the Blue Miao (Hmong Njua) of Thailand. Oxford: The Clarendon Press, 1976. Tapp, N., J.Michaud, C.Culas, G.Y.Lee (Eds) 2004 Hmong/Miao in Asia. Chiang Mai (Thailand): Silkworm, 500p. Vang, Chia Youyee. Hmong America: Reconstructing Community in Diaspora (University of Illinois Press; 2011) 200 pages; Combines scholarly and personal perspectives in an ethnographic history of the Hmong refugee experience in the United States. Edkins, The Miau-tsi Tribes. Foochow: 1870. Bourne, Journey in Southwest China. London: 1888. A. H. Keaw, Man: Past and Present. Cambridge: 1900. Chisholm, Hugh, ed. (1911). "Miaotsze" . Encyclopædia Britannica (11th ed.). Cambridge University Press. Lee, Mai Na M. "The Thousand-Year Myth: Construction and Characterization of Hmong." (Archive) Hmong Studies Journal. v2n2. Northern hemisphere Spring 1998. Meneses, Rashaan. "Hmong: An Endangered People." UCLA International Institute. Merritt, Tragic Mountains: The Hmong, the Americans, and the Secret Wars for Laos, 1942–1992. Indiana: 1999. Mottin, Father Jean. History of the Hmong. Bangkok: Odeon Store, 1980. written in Khek Noi, a Hmong village in northern Thailand, Translated into English by an Irish nun, printed in Bangkok. Quincy, Keith. Hmong: History of a People. Cheney, Wash.: Eastern Washington University Press, 1988. Savina, F.M. Histoire des Miao. 2nd Edition. Hong Kong: Impremerie de la Société des Missions-Etrangères de Paris, 1930. Written by a French missionary who worked in Laos and Tonkin. George, William Lloyd. "Hmong Refugees Live in Fear in Laos and Thailand." TIME. Saturday July 24, 2010. Hookaway, James. "Thai Army Forces Out Refugees." The Wall Street Journal. December 28, 2009. (Lao Veterans of America, Inc.) Laotian and Hmong veterans and refugee families of the Lao Veterans of America, Inc.
Center for Public Policy Analysis (CPPA) in Washington, D.C. Hmong human rights, religious persecution/ religious freedom violations and refugee issues. Hmong-related web sites edited by Mark Pfeifer of the Hmong Cultural Center. Laos & Hmong Refugee Crisis & human rights violations against Hmong people in Southeast Asia, Centre for Public Policy Analysis, Washington, D.C.